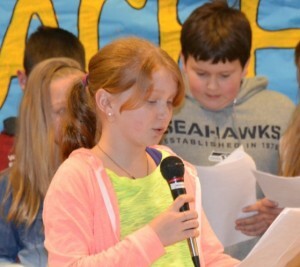 Members of BHS fifth grade Service Club participate in a monthly meeting at school. 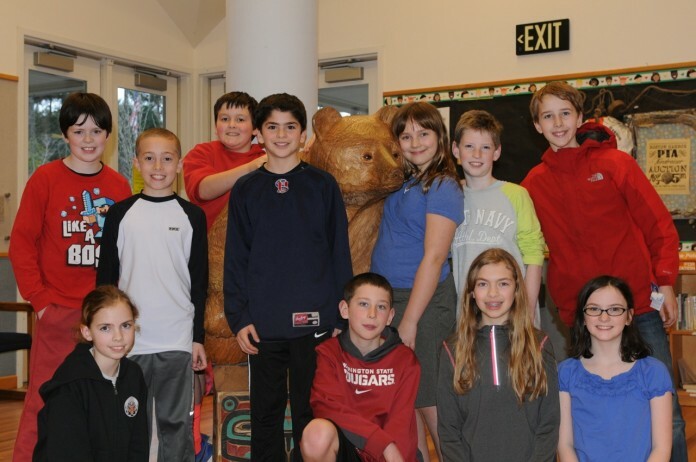 Boston Harbor Elementary School (BHS) is likely the smallest elementary school in the Olympia School District (OSD) but it is mighty when it comes to community service. Every first Tuesday the fifth graders at BHS choose to stay after school for their favorite club. They are not practicing a sport or rehearsing a play. Instead, they stay late to give back to others and learn how to serve their community. And they are having a blast doing it. The Service Club was designed by fifth grade teacher, Bonnie Hauschka, to provide students with the opportunity to learn through participation in service activities that create a more connected and healthy community. The Service Club participates in projects that benefit their school, local, national and international communities. Hauschka had previously taught in Alaska where she launched a service club for middle and high school students. BHS Service Club member Kamiel Helmer presents to the Olympia School District Board to express appreciation for their service in our community. When Hauschka returned to Washington and began teaching at BHS she wanted to offer a similar opportunity. “Seeing the positive impact it had on the kids, their increase in confidence, how they felt about each other, the way they were connected to their community – it really is about getting them to a place where they think ‘how can I help other people.’ There is tremendous power in a group that wants to help others,” she explains. Helping others as a group is one of the favorite aspects of most of the students in Service Club. “I chose to participate in Service Club because I thought it would be fun to make a difference in the community and help out others with my friends,” shares student Olivia Sloma. Making cards for Alzheimer patients at Evergreen Nursing Home, pulling ivy at Burfoot Park, picking up litter at Boston Harbor Marina, redesigning school bulletin boards and painting a playground mural are all more meaningful when contributing as a group. The Service Club’s efforts are also far-reaching. This spring, they will conduct a coin drive to raise money for books for a children’s school in Cambodia. 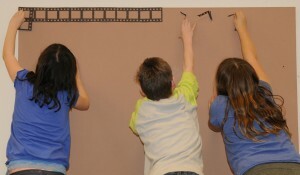 One of the best-loved Service Club activities is Family Movie Night where it is as if the students are directing their own little theater and raising money for those in need. Cecelia Baldwin greets people at the door with a British accent, Nathan Foley sets up the chairs in theater style, and Jackson Twitty knows he is making a difference through the sale of concessions. Proceeds from the concessions are donated to an organization of the Service Club’s choosing which have included typhoon relief, breast cancer research, local homeless shelters and the Thurston County Food Bank where Service Club members volunteered a Saturday in the fall. 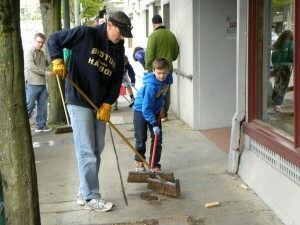 Boston Harbor Elementary School father and son duo, Travis and Cale Matheson participate in the 2013 Olympia Downtown Spring Cleanup as part of the BHS Service Club. This spring the Service Club will be helping host a bookfair at Barnes & Noble where 15% of proceeds will be donated to the South Sound Reading Foundation (SSRF). The Service Club chose this organization to be the recipient of the proceeds because the students support SSRF’s efforts to increase the number of children entering school prepared to learn, read, and succeed. Service Club members will be reading books to children, performing skits on selected books, and assisting attendees. The BHS Service Club members are learning to be caring leaders. So when BHS hosted the OSD Board meeting, Hauschka saw this as an opportunity to teach the club members about the school board’s dedication to service as well as express appreciation for giving of their volunteer time and helping others. Students presented to the OSD Board stating “We know that you do this so our district continues to be a great place to grow and learn.” A simple gesture of young service leaders recognizing others dedicated to service. BHS Service Club Members participate in school beautifying project including bulletin board update in computer lab. Undoubtedly the BHS Service Club’s circle of helping has had a ripple effect throughout our community and beyond.